Ray Rice headed for suspension?! "Ray’s character, you guys know his character, so you start with that," says John Harbaugh, head coach of the Baltimore Ravens. 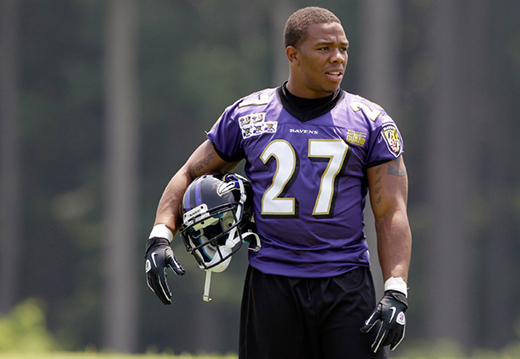 Raymell Maurice Rice (a.k.a Ray Rice) has continually been a popular football player within the Ravens community and NFL fanbase. At age 27, reaching 5 feet 8 inches tall, 212 pounds, Ray Rice has resilient body strength, a humble personality, and career stats that corroborate his ongoing recognition. As a valuable, multifaceted running back, he has proven to be a favored teammate. Recently, Rice had shown a slight change in his honorable talent. In 2012, he rushed a total of 1,143 yards and 9 touch downs as well as winning his first Superbowl. 2013 approached and things were a little different. It was the first year he didn't hit the 1,000 yard mark since his rookie season in 2008. During week 2, Rice suffered a hip flexor injury, damaging his potential. He pushed through the discomfort and finished the season with only 660 total rushing yards and 4 touchdowns. With numbers so low, Ray Rice was faced with the judgement and criticism of the public. Not only did he have an off season, just last week he was arrested for a domestic altercation with his fiance, Janay Palmer. A few days later, a video surfaced the media of Rice dragging her unconscious body through a casino elevator. The first emotion that comes to one's mind is shock and immediate sympathy for his fiance. Although her wellness is of utmost importance, it's also important to take a step back and look at the facts of the situation. Should the Baltimore Ravens suspend arguably one of the best players left on their team? Take a look at linebacker Terrell Suggs. He was never suspended for allegations stating he punched his girlfriend in the neck. The difference between the two stories is a surveillance video. The issues concerned in the surveillance video ultimately fall back onto previous behavior, actions before the initial incident. We do not know whether she was unconscious from intoxication or domestic violence, but what we do know is without the facts we can't be so quick to slam the gavel down. Luckily for Ray Rice the Baltimore Ravens have always maintained a family atmosphere. General manager Ozzie Newsome and head coach John Harbaugh undoubtedly stand by their players during difficult measures. But is that enough to keep Rice on the field in the upcoming season? The Ravens are still in the process of rebuilding and not all facts have been released so it is easy to assume he is headed for downfall. And let's not forget he is still recovering from a hip injury. Rice has consistently proven his outstanding talent as a football player, appreciation for the community and valuation as a team leader. A suspension could potentially impair the Baltimore Ravens as a team wholeheartedly. Therefor, we can only hope the outcome of this injurious situation is a positive.